I'm putting this under seasonal, since I'm not sure where else to put it. I was thinking it might be a new Bricktober thing. 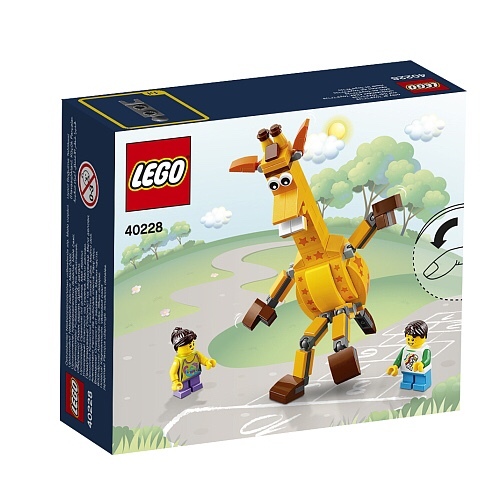 Oh ... and if it is, and if the mini-modular Bricktober sets are hereby done, I'm hoping they'll start increasing in value (though that might be false hope given how many were left at TRU the last half year). He is a little odd looking. Reminds me of Barney and friends. I'd pick one up as a free with purchas promo. Geoffrey is like Ronald McDonald, always creepy, but not as creepy Burger King. Although, the King is so creepy, I find him humorous. He looks angry to me... must be the TRU markup that gets him mad. Nope - it's all those coupon printing brickpickers who stack discounts, coupons and giftcards that tick him off .... it's eating up his profits :). See how he is using his front legs to shield poor Timmy and Sally from all the greedy resellers? Dunno, he kind of looks fat... I think he could stand to lose a few dollars, err, pounds. Geoffrey is like Ronald McDonald, always creepy, but not as creepy Burger King. How about the trash can? That thing is scary and ugly. Still have 2015 minis sitting on the shelf at $9.98 at two of my TRUs. Tons of them. He looks deranged in the third picture and he's holding his hands out to the kids like, "come with me so I can kill you''. I took it to a dark place didn't I? Is ti just me or does he look rather deranged? like others said, might as well be chester the molester. Found these today in Canada TRU for $4.99 CAD.